I use tmux to manage and switch between multiple terminal sessions. 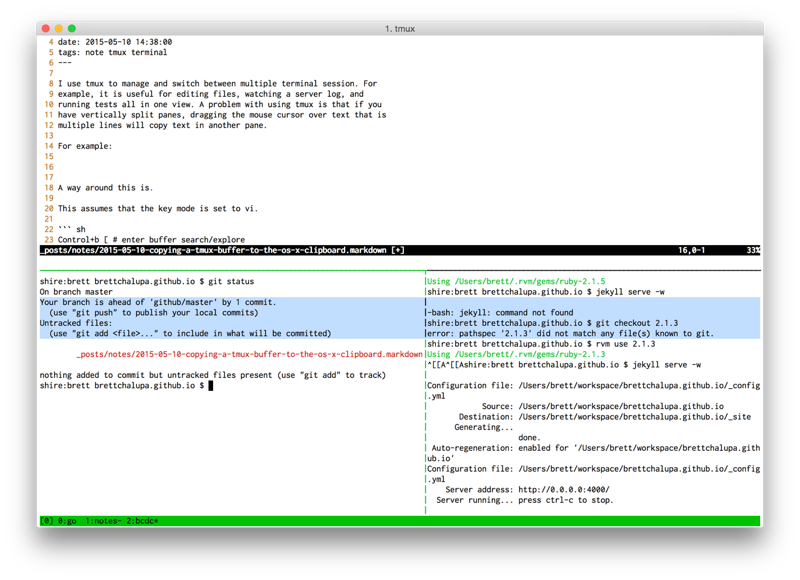 tmux is useful for editing files, watching a server log, and running tests all in one window. A problem with using tmux is that if you have vertically split panes, dragging the mouse cursor over text to select it will highlight text in the neighbor vertical pane. A way around this is to use the tmux flow of selecting text in a pane, copying it tmux’s buffer, and then moving that buffer into the OS X clipboard. Now that output can be pasted anywhere by using Command+v. alias tmcp="tmux show-buffer | pbcopy"